Roho Mosaic Wheelchair Cushion: Designed for patients who are at risk for skin breakdown, this cushion has 3" interconnected air cells that are easy to set up and adjust. 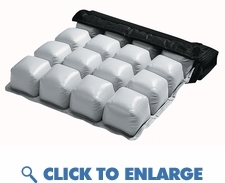 Mosaic cushion provides a comfortable, functional and stable sitting environment and comes with a washable, non-skid cover. 300 lb. weight capacity. Hand inflation pump included.